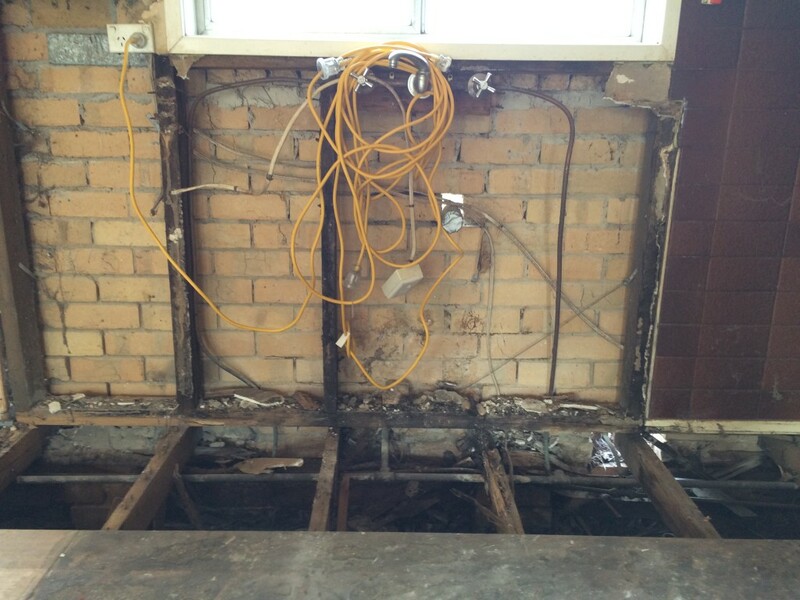 When we purchased our investment property in Frankston, we knew we had termites. 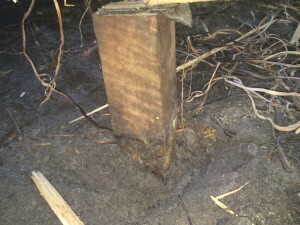 The termite problem was both a symptom and consequence of the broader damp issues affecting our property. The slope of the site meant water had run under the home over a long period of time creating damp conditions. We also pulled out the kitchen to reveal a slow, long term water leak that had never been addressed. So on top of our existing renovation dreams – gutting the bathroom and kitchen for something stylish and chic – we now have a few soggy and smelly walls to deal with. This sounds serious! What is rising damp? Rising damp kind of creeps up on you. It happens over years not even weeks or months. Rising damp, or salt damp as it’s often called, will be noticed first on the bottom parts of your walls. 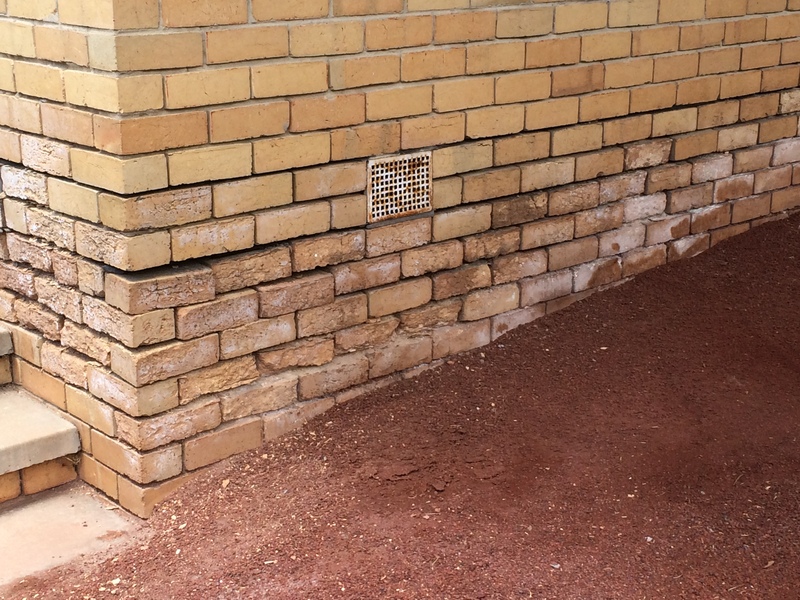 It rises from the ground up because the damp proof course – that all houses are legally required to have – is not doing what it’s supposed to. And that’s stopping the moisture from rising. Or maybe your home was built before this barrier was required. 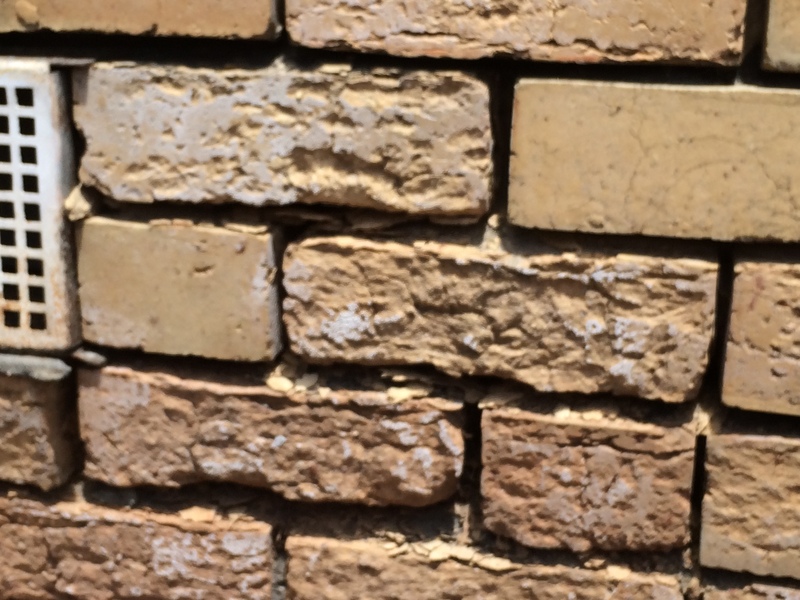 The tell tale signs are yellowish or brownish staining, rotting skirting boards and fluffy deposits in plaster or as in our case white salt deposits on the external perimeter brick work and decaying, sandy mortar. We also found mould on the interior of the walls adjacent to affected external areas as shown below. Bloody hell. Why on earth would that happen? As was the case with our property, it was all to do with the dodgy drainage. Our house is built on a slope, so there’s a build up of moisture from the back to the front of the underside of the house as surface water tries to drain away. A tired, old damp proof course that no longer copes. Old houses = old damp proof courses. Inadequate sub-floor ventilation. This will lead to a build up of humidity. Basically, your walls can’t ‘breath’. This can be caused by sub-floor obstructions or simply a lack of vents being installed. If you have a garden or veggie patch and it’s located quite close to or abutting your house, this can also cause problems with rising damp. Make sure you retain your garden beds back from the walls to deter moist conditions. An easy field guide to rising damp solutions and water leaks. 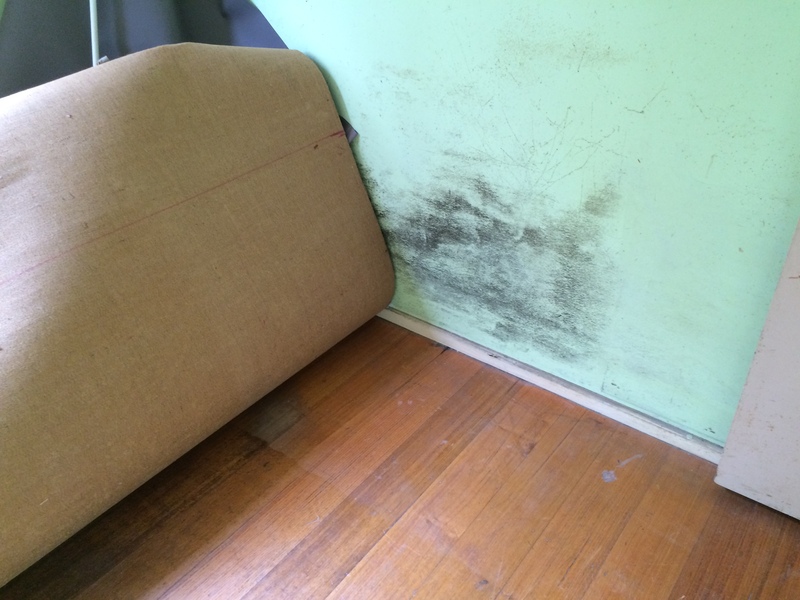 Rising damp has many health risks. Rising damp is essentially mould, and mould can be toxic. The health risks include sneezing, asthma and other respiratory problems, headaches, rashes, tiredness, and watery, itchy eyes. If you have a rising damp dilemma, get onto it asap, as easy as it is to ignore a slow moving problem like this. Below are the most common and easiest ways to control rising damp, but your local building inspector or builder will be able to find the best solution for you. Firstly, tear everything apart. Not really! 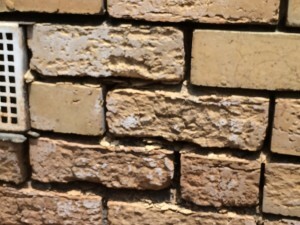 But a professional will remove and replace old, affected bricks and stone with fresh ones, and a new plastic damp course underneath. This solves the problem beautifully, but as you might have guessed is more costly, messy and takes a really long time. It can also cause problems with the structural integrity of the building. Alternatively, you could create a barrier. This is done using a chemical damp course at the lowest point of the wall. This will prevent any more rising water entering the wall above, but you’ll of course be left to deal with the damage. Its like an injectable goop that they fill the spaces in and between bricks with. This is easily down by removing any obstructions,and installing more vents. However some additional solutions include installing powered or mechanical air circulation devices and even modifying the exterior and interior ground levels to improve air movement. Firstly, you’ll need to test for leaks. Turn off all taps and check your water meter. If it still detects a flow, then bingo! You have a leak. If you’ve fixed all of your leaks and still have issues, get in touch with a licensed plumber to get on the case. They’ll be able to detect any cracked or damaged pipes – both sewerage and storm water. If its a site drainage issues simple tests like putting the hose on in the highest point of the yard and watching which way the water flows to get to the lowest point will highlight where you need to divert the water before it hits your home or any other major structures. This is the project that I will be working on next in my Renovation. I am using the combination of French Drain and a Rainwater Garden to divert water around not through the home. Have you ever dealt with this mouldy situation? What are your tips for preventing rising damp? Let me know in the comments below!